This is a small, free-living form. It is very similar to M. brasiliensis, which is endemic to Brazil, but this Caribbean species is considered to be a separate species (ref below). It lives on rubble or sandy bottoms and in seagrass beds, and prefers deeper water. It forms oval shaped colonies, with relatively wide valleys. Pinzon JH and Weil, E. In Press. 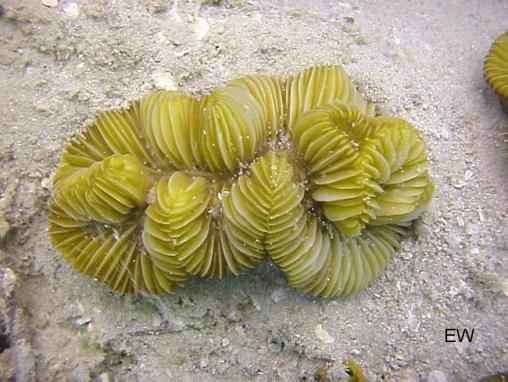 Species variability in the Atlantic scleractinian coral genus Meandrina. A Multivariate Analysis of the Scleractinian Genus Meandrina (Lamarck, 1801): evidence for a new species. Biological Bulletin.